In recent months, opponents of strengthening equal pay protections have parroted a common refrain from the Trump administration and its supporters by focusing on the fact that women gained 58 percent—or roughly 1.5 million—of all new private sector jobs created in 2018. They tout this singular piece of data as evidence that the economy must be working well for women and their wages. However, this talking point obscures and oversimplifies the diverse experiences of working women—particularly women of color—and ignores why equal pay is so critical to women’s economic progress. Women’s full participation in the economy is indeed vital to U.S. economic growth and gender equality. Yet women must also have access to quality, well-paying jobs in which they have a fair chance in order to succeed and maximize their contributions to their families and the economy. Equal pay is central to the broad goal of improving women’s economic standing while also creating equitable workplaces that pay and treat all women fairly. Achieving both prongs of this goal requires an intentional focus on ensuring women’s equal treatment in the workplace—including across factors such as gender, race, ethnicity, disability, and LGBTQ status—and ensuring women’s access to quality job opportunities. Expanding access to jobs in which women face discrimination will do little to move them or their families forward in the long term. For this reason, policymakers must make a simultaneous commitment to equality and opportunity, as these two principles are inextricably linked and one without the other would result in little overall progress for women. Understanding this relationship between equality and opportunity is particularly important in the current conversation about the economy, jobs, and equal pay. 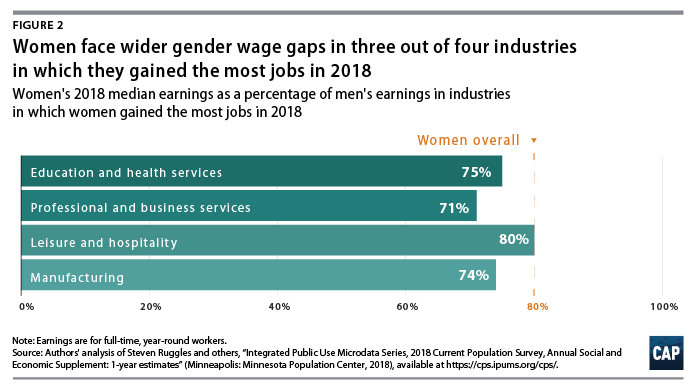 A closer look at wage differences in the industries where women gained the most jobs in 2018 suggests a different story about how women are faring in the economy and where interventions are needed. Analysis of monthly jobs data from the Bureau of Labor Statistics’ (BLS) Current Employment Statistics survey shows that among the roughly 1.5 million private sector jobs gained by women in 2018, slightly less than 80 percent fall into four primary industry categories: education and health services; professional and business services; leisure and hospitality; and manufacturing. (see Figure 1) While women working full-time, year-round, on average, earn 80 cents for every dollar earned by men, analysis of data from the BLS’ 2018 Current Population Survey (CPS) Annual Social and Economic Supplement reveal that, on average, women working in three out of these four industries—which, combined, account for more than 60 percent of jobs gained by women in 2018—experience an even wider gender wage gap. (see Figure 2) Part-time work is also included in the roughly 1.5 million jobs gained by women in 2018, but these jobs actually widen the overall gender wage gap. Unfortunately, the gender wage gap is nothing new for women. The overall gender earnings ratio—which divides women’s median earnings by men’s median earnings—has changed marginally over the past decade. Women continue to experience pay discrimination and earn less than men. This stubborn wage gap makes clear that women’s progress in the workplace must include both access to new jobs and intentional efforts to address persistent pay disparities. Without an intentional focus on equal pay, new jobs for women will continue to come with depressed wages. Moreover, it is essential to examine pay disparities across all industries, as the wage gap can be wider due to occupational segregation and lack of work-family policies. Data also show that the wage gap is wider for most women of color due to the intersection of racial, ethnic, and gender biases. In 2017, for example Latinas working full-time, year-round earned only 53 cents for every dollar earned by white, non-Hispanic men. Meanwhile, black women and American Indian and Alaska Native women earned 61 cents and 58 cents, respectively, for every dollar earned by white, non-Hispanic men. 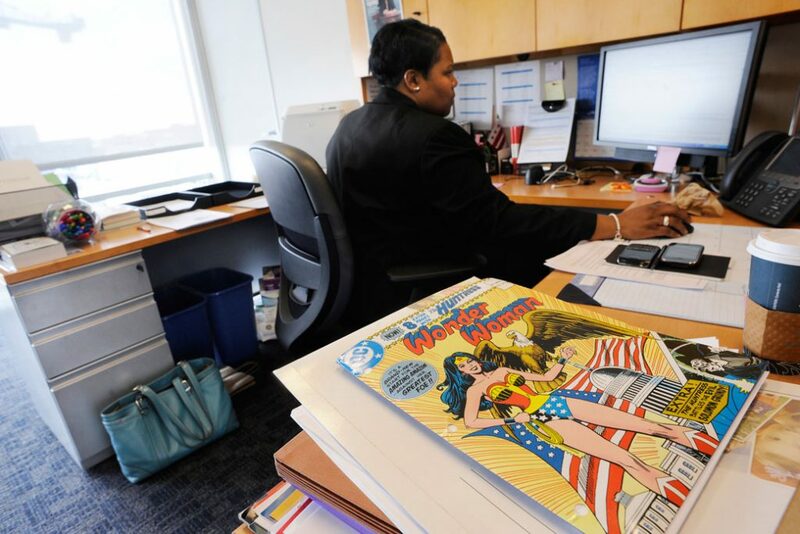 The failure to pursue concrete strategies to strengthen equal pay protections and combat discriminatory pay practices risks imposing even larger economic impacts on many women of color, who are disproportionately more likely to work in lower-paying jobs. Relying on a narrow talking point about the percentage of new jobs going to women, while ignoring the need for concrete measures to strengthen equal pay protections, reflects a fundamental misunderstanding of the action steps needed to promote women’s economic security and equality. No woman—or man—should have to settle for unequal pay in order to get a job. If policymakers are truly committed to advancing women’s economic opportunities, they must place equal focus on improving women’s wages and improving women’s access to jobs. Support for proposals such as the Paycheck Fairness Act—which would limit pay secrecy, expand pay data collection, promote greater employer accountability for pay differences, and strengthen the investigatory tools that enforcement agencies can use to examine employer pay practices—would be a critical step forward. Addressing pay discrimination and ensuring equal pay for women must be a top priority in every job and industry in order to ensure that women’s economic success is not merely a talking point but also a reality. Jocelyn Frye is a senior fellow at the Center for American Progress. Diana Boesch is a research assistant of women’s economic security for the Women’s Initiative at the Center. The authors would like to thank Katherine Gallagher Robbins and Michael Madowitz from the Center for American Progress for their valuable input and review.